For example, the address of the script's document is used to set the address of any Document elements created using createDocument(). Either a Document (specifically, the script's document), or a URL, which is used by some APIs to determine what value to use for the Referer (sic) header in calls to the fetching algorithm. Let previous script clean-up jobs list have the value of the current global script clean-up jobs list. Empty the global script clean-up jobs list. Run the global script clean-up jobs. Set the global script clean-up jobs list to the value of previous script clean-up jobs list. This algorithm is not invoked by one script directly calling another, but it can be invoked reentrantly in an indirect manner, e.g. if a script dispatches an event which has event listeners registered. Each unit of related similar-origin browsing contexts can have an entry script which is used to obtain, amongst other things, the script's base URL to resolve relative URLs used in scripts running in that unit of related similar-origin browsing contexts. Initially, there is no entry script. It is changed by the jump to a code entry-point algorithm above. Each unit of related similar-origin browsing contexts has a running mutation observers flag, which must initially be false. It is used to prevent reentrant invocation of the algorithm to invoke MutationObserver objects. For the purposes of MutationObserver objects, each unit of related similar-origin browsing contexts is a distinct scripting environment. When the user agent is to run the global script clean-up jobs, the user agent must perform each of the jobs in the global script clean-up jobs list and then empty the list. Set up the script's global object, the script's browsing context, the script's document, the script's referrer source, the script's URL character encoding, and the script's base URL from the settings passed to this algorithm. When the user agent is to create an impotent script, given some script source and URL, its scripting language, and a browsing context, the user agent must create a script, using the given script source, URL, and scripting language, using a new empty object as the global object, and using the given browsing context as the browsing context. The referrer source, URL character encoding, and base URL for the resulting script are not important as no APIs are exposed to the script. The referrer source is document. User agents may allow users to specifically disable scripts just for the purposes of closing a browsing context. For example, the prompt mentioned in the example above could also offer the user with a mechanism to just close the page entirely, without running any unload event handlers. If the location URL does not have a same origin as the origin, then set message to "Script error. ", set location to the empty string, and set line and col to 0. Set up the script's global object, the script's browsing context, the script's document, the script's referrer source, the script's URL character encoding, and the script's base URL from the script settings determined from the node on which the attribute is being set. Firing a synthetic mouse event named e means that an event with the name e, which is trusted (except where otherwise stated), does not bubble (except where otherwise stated), is not cancelable (except where otherwise stated), and which uses the MouseEvent interface, must be created and dispatched at the given target. The event object must have its screenX, screenY, clientX, clientY, and button attributes initialized to 0, its ctrlKey, shiftKey, altKey, and metaKey attributes initialized according to the current state of the key input device, if any (false for any keys that are not available), its detail attribute initialized to 1, and its relatedTarget attribute initialized to null. The getModifierState() method on the object must return values appropriately describing the state of the key input device at the time the event is created. If the length of input divides by 4 leaving no remainder, then: if input ends with one or two "=" (U+003D) characters, remove them from input. Each object that implements the WindowTimers interface has a list of active timers. Each entry in this lists is identified by a number, which must be unique within the list for the lifetime of the object that implements the WindowTimers interface. Let handle be a user-agent-defined integer that is greater than zero that will identify the timeout to be set by this call in the list of active timers. Add an entry to the list of active timers for handle. Get the timed task handle in the list of active timers, and let task be the result. This algorithm uses the first argument to the method (handler) and, if there are any, the third and subsequent arguments to the method (arguments), to establish precisely what task does. Let timeout be the second argument to the method, or zero if the argument was omitted. If the currently running task is a task that was created by the setTimeout() method, and timeout is less than 4, then increase timeout to 4. Return handle, and then continue running this algorithm asynchronously. If the method context is a Window object, wait until the Document associated with the method context has been fully active for a further timeout milliseconds (not necessarily consecutively). Otherwise, if the method context is a WorkerUtils object, wait until timeout milliseconds have passed with the worker not suspended (not necessarily consecutively). Otherwise, act as described in the specification that defines that the WindowTimers interface is implemented by some other object. This is intended to allow user agents to pad timeouts as needed to optimise the power usage of the device. For example, some processors have a low-power mode where the granularity of timers is reduced; on such platforms, user agents can slow timers down to fit this schedule instead of requiring the processor to use the more accurate mode with its associated higher power usage. Once the task has been processed, it is safe to remove the entry for handle from the list of active timers (there is no way for the entry's existence to be detected past this point, so it does not technically matter one way or the other). If timeout is less than 4, then increase timeout to 4. Wait: If the method context is a Window object, wait until the Document associated with the method context has been fully active for a further interval milliseconds (not necessarily consecutively). Otherwise, if the method context is a WorkerUtils object, wait until interval milliseconds have passed with the worker not suspended (not necessarily consecutively). Return to the step labeled wait. The method context, when referenced by the algorithms in this section, is the object on which the method for which the algorithm is running is implemented (a Window or WorkerUtils object). If the entry for handle in list has been cleared, then abort this task's substeps. Setting thisArg to undefined means that the function code will be executed with the this keyword bound to the WindowProxy or the WorkerGlobalScope object, as if the code was running in the global scope. Otherwise, continue with the remaining steps. Let script source be the first argument to the method. If the method context is a Window object, let global object be the method context, let browsing context be the browsing context with which global object is associated, let document and referrer source be the Document associated with global object, let character encoding be the character encoding of the Document associated with global object (this is a reference, not a copy), and let base URL be the base URL of the Document associated with global object (this is a reference, not a copy). Otherwise, if the method context is a WorkerUtils object, let global object, browsing context, document, referrer source, character encoding, and base URL be the script's global object, script's browsing context, script's document, script's referrer source, script's URL character encoding, and script's base URL (respectively) of the script that the run a worker algorithm created when it created the method context. Return a task that checks if the entry for handle in list has been cleared, and if it has not, creates a script using script source as the script source, the URL where script source can be found, scripting language as the scripting language, global object as the global object, browsing context as the browsing context, document as the document, referrer source as the referrer source, character encoding as the URL character encoding, and base URL as the base URL. A call to the navigator.yieldForStorageUpdates() method is implied when this method is invoked. If the event loop's termination nesting level is non-zero, optionally abort these steps. Show the given message to the user. Optionally, pause while waiting for for the user to acknowledge the message. If the event loop's termination nesting level is non-zero, optionally abort these steps, returning false. Show the given message to the user, and ask the user to respond with a positive or negative response. If the event loop's termination nesting level is non-zero, optionally abort these steps, returning null. Show the given message to the user, and ask the user to either respond with a string value or abort. The second argument is optional. If the second argument (default) is present, then the response must be defaulted to the value given by default. When the print() method is invoked, if the Document is ready for post-load tasks, then the user agent must synchronously run the printing steps. Otherwise, the user agent must only set the print when loaded flag on the Document. The user agent must fire a simple event named beforeprint at the Window object of the Document that is being printed, as well as any nested browsing contexts in it. The user agent must fire a simple event named afterprint at the Window object of the Document that is being printed, as well as any nested browsing contexts in it. Resolve url relative to the entry script's base URL. If this fails, then throw a SyntaxError exception and abort these steps. If the event loop's termination nesting level is non-zero, optionally abort these steps, returning the empty string. If the user agent is configured such that this invocation of showModalDialog() is somehow disabled, then return the empty string and abort these steps. If the active sandboxing flag set of the active document of the browsing context of the script that invoked the method has its sandboxed auxiliary navigation browsing context flag set, then return the empty string and abort these steps. Set all the flags in the new browsing context's popup sandboxing flag set that are set in the active sandboxing flag set of the active document of the browsing context of the script that invoked the method. The browsing context of the script that invoked the method must be set as the new browsing context's one permitted sandboxed navigator. The Window objects of Documents hosted by browsing contexts created by the above algorithm must also implement the WindowModal interface. The dialogArguments IDL attribute, on getting, must check whether its browsing context's active document's origin is the same as the dialog arguments' origin. If it is, then the browsing context's dialog arguments must be returned unchanged. Otherwise, if the dialog arguments are an object, then the empty string must be returned, and if the dialog arguments are not an object, then the stringification of the dialog arguments must be returned. The returnValue IDL attribute, on getting, must return the return value of its browsing context, and on setting, must set the return value to the given new value. These interfaces are defined separately so that other specifications can re-use parts of the Navigator interface. Any information in this API that varies from user to user can be used to profile the user. In fact, if enough such information is available, a user can actually be uniquely identified. For this reason, user agent implementors are strongly urged to include as little information in this API as possible. Registers a handler for the given scheme or content type, at the given URL, with the given title. Throws a SecurityError exception if the user agent blocks the registration (this might happen if trying to register as a handler for "http", for instance). Throws a SyntaxError if the "%s" string is missing in the URL. A scheme, such as mailto or web+auth. The scheme must be compared in an ASCII case-insensitive manner by user agents for the purposes of comparing with the scheme part of URLs that they consider against the list of registered handlers. If the registerProtocolHandler() method is invoked with a scheme that is neither a whitelisted scheme nor a scheme whose value starts with the substring "web+" and otherwise contains only characters in the range lowercase ASCII letters, the user agent must throw a SecurityError exception. This list can be changed. If there are schemes that should be added, please send feedback. A MIME type, such as model/vnd.flatland.3dml or application/vnd.google-earth.kml+xml. The MIME type must be compared in an ASCII case-insensitive manner by user agents for the purposes of comparing with MIME types of documents that they consider against the list of registered handlers. The type is compared to the MIME type used by the user agent after the sniffing algorithms have been applied. If the registerContentHandler() method is invoked with a MIME type that is in the type blacklist or that the user agent has deemed a privileged type, the user agent must throw a SecurityError exception. User agents must throw a SyntaxError exception if the url argument passed to one of these methods does not contain the exact literal string "%s". User agents must throw a SyntaxError if resolving the url argument relative to the entry script's base URL, is not successful. The resulting absolute URL would by definition not be a valid URL as it would include the string "%s" which is not a valid component in a URL. User agents must throw a SecurityError exception if the resulting absolute URL has an origin that differs from the origin of the entry script. The resulting absolute URL is the proto-URL. It identifies the handler for the purposes of the methods described below. When the user agent uses this handler, it must replace the first occurrence of the exact literal string "%s" in the url argument with an escaped version of the absolute URL of the content in question (as defined below), then resolve the resulting URL, relative to the base URL of the entry script at the time the registerContentHandler() or registerProtocolHandler() methods were invoked, and then navigate an appropriate browsing context to the resulting URL using the GET method (or equivalent for non-HTTP URLs). In addition to the registration methods, there are also methods for determining if particular handlers have been registered, and for unregistering handlers. Indicates that no attempt has been made to register the given handler (or that the handler has been unregistered). It would be appropriate to promote the availability of the handler or to just automatically register the handler. Indicates that the given handler has been registered or that the site is blocked from registering the handler. Trying to register the handler again would have no effect. Indicates that the given handler has been offered but was rejected. Trying to register the handler again may prompt the user again. The isProtocolHandlerRegistered() method must return the handler state string that most closely describes the current state of the handler described by the two arguments to the method, where the first argument gives the scheme and the second gives the string used to build the URL of the page that will handle the requests. The isContentHandlerRegistered() method must return the handler state string that most closely describes the current state of the handler described by the two arguments to the method, where the first argument gives the MIME type and the second gives the string used to build the URL of the page that will handle the requests. The first argument must be compared to the MIME types for which custom content handlers are registered in an ASCII case-insensitive manner to find the relevant handlers. The handler state strings are the following strings. Each string describes several situations, as given by the following list. The described handler has never been registered for the given scheme or type. The described handler was once registered for the given scheme or type, but the site has since unregistered it. If the handler were to be reregistered, the user would be notified accordingly. The described handler was once registered for the given scheme or type, but the site has since unregistered it, but the user has indicated that the site is to be blocked from registering the type again, so the user agent would ignore further registration attempts. The described handler is registered for the given scheme or type (maybe, or maybe not, as the default handler). An attempt was made to register the described handler for the given scheme or type, but the user has not yet responded. An attempt was made to register the described handler for the given scheme or type, but the user declined the offer. The user has not indicated that the handler is to be permanently blocked, however, so another attempt to register the described handler might result in the user being prompted again. The described handler was once registered for the given scheme or type, but the user has since removed it. The user has not indicated that the handler is to be permanently blocked, however, so another attempt to register the described handler might result in the user being prompted again. The unregisterContentHandler() method must unregister the handler described by the two arguments to the method, where the first argument gives the MIME type and the second gives the string used to build the URL of the page that will handle the requests. If the string does not contain the substring "%s", abort these steps. There's no matching handler. Resolve the string relative to the base URL of the entry script. If this fails, then throw a SyntaxError exception, aborting the method. If the resoluting absolute URL's origin is not the same origin as that of the entry script throw a SecurityError exception, aborting the method. Return the resulting absolute URL as the result of preprocessing the argument. Hijacking all Web usage. User agents should not allow schemes that are key to its normal operation, such as http or https, to be rerouted through third-party sites. This would allow a user's activities to be trivially tracked, and would allow user information, even in secure connections, to be collected. No actual confidential file data is leaked in this manner, but the URLs themselves could contain confidential information. For example, the URL could be http://www.corp.example.com/upcoming-aquisitions/the-sample-company.egf, which might tell the third party that Example Corporation is intending to merge with The Sample Company. Implementors might wish to consider allowing administrators to disable this feature for certain subdomains, content types, or schemes. Leaking secure URLs. User agents should not send HTTPS URLs to third-party sites registered as content handlers without the user's informed consent, for the same reason that user agents sometimes avoid sending Referer (sic) HTTP headers from secure sites to third-party sites. 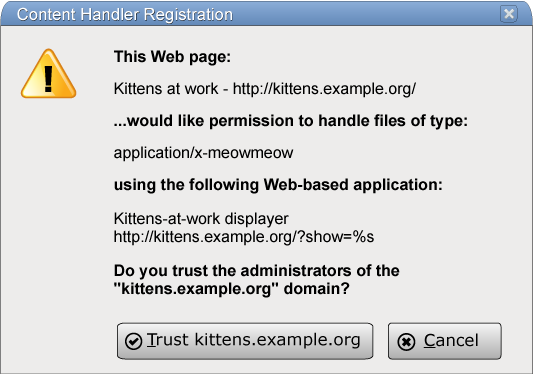 In this dialog box, "Kittens at work" is the title of the page that invoked the method, "http://kittens.example.org/" is the URL of that page, "application/x-meowmeow" is the string that was passed to the registerContentHandler() method as its first argument (mimeType), "http://kittens.example.org/?show=%s" was the second argument (url), and "Kittens-at-work displayer" was the third argument (title). In this dialog, the third option is the one that was primed by the site registering itself earlier. 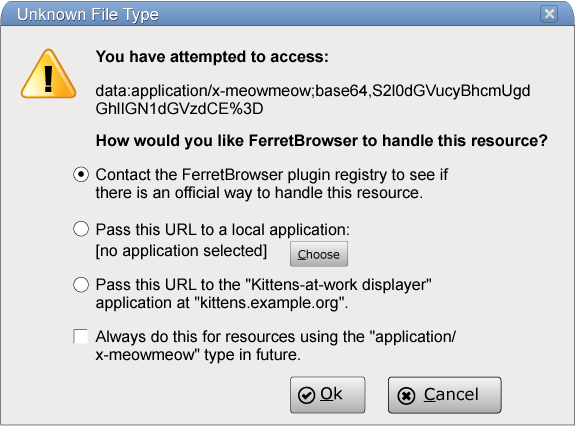 If the user does select that option, then the browser, in accordance with the requirements described in the previous two sections, will redirect the user to "http://kittens.example.org/?show=data%3Aapplication/x-meowmeow;base64,S2l0dGVucyBhcmUgdGhlIGN1dGVzdCE%253D". The registerProtocolHandler() method would work equivalently, but for schemes instead of unknown content types. Calling the navigator.yieldForStorageUpdates() method tells the user agent to unblock any other scripts that may be blocked, even though the script hasn't returned. The yieldForStorageUpdates() method, when invoked, must, if the storage mutex is owned by the event loop of the task that resulted in the method being called, release the storage mutex so that it is once again free. Otherwise, it must do nothing. The external attribute of the Window interface must return an instance of the External interface. The same object must be returned each time. The OpenSearch description document has to be on the same server as the script that calls this method. Returns a value based on comparing url to the URLs of the results pages of the installed search engines. None of the installed search engines match url. One or more installed search engines match url, but none are the user's default search engine. The user's default search engine matches url. The url is compared to the URLs of the results pages of the installed search engines using a prefix match. Only results pages on the same domain as the script that calls this method are checked. Another way of exposing search engines using OpenSearch description documents is using a link element with the search link type. Optionally, abort these steps. User agents may implement the method as a stub method that never does anything, or may arbitrarily ignore invocations with particular arguments for security, privacy, or usability reasons. Resolve the value of the method's first argument relative to the entry script's base URL. If this fails, abort these steps. Optionally, return 0 and abort these steps. User agents may implement the method as a stub method that never returns a non-zero value, or may arbitrarily ignore invocations with particular arguments for security, privacy, or usability reasons. If the origin of the entry script is an opaque identifier (i.e. it has no host component), then return 0 and abort these steps. Let host1 be the host component of the origin of the entry script. Resolve the scriptURL argument relative to the entry script's base URL. If this fails, return 0 and abort these steps. Let host2 be be the <host> component of the resulting absolute URL. If the next domain component of host1 and host2 after their common suffix are not the same, then return 0 and abort these steps. If search engines is empty, return 0 and abort these steps. If the user's default search engine (as determined by the user agent) is one of the search engines in search engines, then return 2 and abort these steps.